*Updated now Lightroom support added* Having spent a couple of weeks with the new Nikon D4s, I promised myself not to get too geeky with it, and indeed for the most part I shot real world subjects. But the ‘improved’ ISO performance was nagging at me. It was good, but with my D4 also by my side, I wasn’t sure if it was BETTER. So, I did a more controlled test. First, please remember, noise reduction software is very good these days. In fact, I mostly shoot with the D800 now which is noisier than the D4. But, Lightroom is very good at removing it. As such, don’t put all your main importance of upgrading to a new camera on the noise handling alone. Most camera’s these days are very capable – especially compared to where DSLR’s started! It took me a long time to get myself out of the ‘no noise’ mindset. But equally, it’s nice to know what the performance is capable of with these camera’s, so a little geeking never hurt anyone once in a while (and it’s been a while for me!). I only tested three ISO’s, 6400, 12800 and 25600 as I was only interested in the higher end of the usable range as the lower end I have no issues with (and I didn’t want, nor have the time, to turn this in to a million sample exercise). But with the D4s having a new sensor and reading reports of over 1EV better performance in higher ISO’s, my real world shooting wasn’t convincing me. I needed to check a little more carefully. Test was simple. I placed my D800 on the fireplace in the bedroom. Set my 70-200 up on a tripod using it’s foot, drew the black out blind and pushed the door shut, but not closed so some light could come in through the frame. I didn’t want the room well lit, as the whole point of high ISO (generally) is to shoot in low light. I took each ISO shot together. E.G. I shot the ISO 6400 image on the D4, then immediately took it off the lens and attached the D4s and took an image with identical settings. I then moved on to the next ISO setting and did the same. Images were then opened in Nikon Capture (come on Lightroom, give us the support update! see further below for Lightroom comparisons) and I clicked Noise Reduction off again, as Capture has a habit of ticking it on when you open RAW files. Saved to TIFF and opened in PS to supply the crops. In the case of ISO 25,600 vs HI 1 – I found the older D4 to produce a BETTER file in my experience. Lots of white dots to be found in the D4s at it’s native ISO! Now that Lightroom has added support for the D4s, I imported these files and had another look at them both with and without Noise Reduction applied. 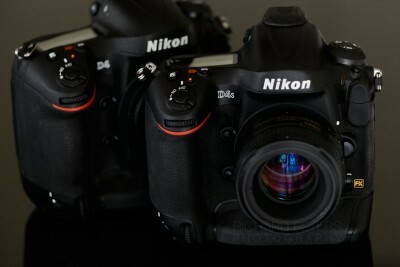 To my eye, rather than the D4 looking better, the D4s now just comes up a notch to be on par with it. If there wasn’t a label on the photos telling you which is which, you’d be hard pressed to pick them apart. The images below are quite large. If you’re on a low resolution screen, you’ll be able to drag them around inside the window they open in.